‘Living with the times’, is a motto of the late Lubavitcher Rebbe zt”l that resonates with me. He suggested that every day we ought to find inspiration from a segment of the current Torah reading. So what are we to make of the confluence of Fashion Week in New York over the last few days and in London over the Shabbat in which we read the sedra of Tezaveh ? London Fashion Week (LFW) takes place twice a year – in February and September, one of the big four international fashion trade events together with Paris, Milan, New York – where designers showcase their new creations to an audience of 5000 buyers and press. If you follow fashion, or have seen photos of what is presented on the catwalks you know that the new fashion collection that are presented are very creative but not really practical or even wearable for most of us. So is it relevant to normal people, who are neither in the business, nor celebrities invited to grace the front row? But before you are tempted to dismiss it as just shmattes, it is worth bearing in mind that the LFW alone generates between £40 -100 million in sales. And the global apparel market is valued at 3 trillion dollars, and accounts for 2 percent of the world’s GDP. The Torah portion of Tezaveh presents God’s own debut as a designer, with a capsule collection specially designed for the kohen gadol, the high priest. God is incredibly specific in detailing the exact fabric, the color, the size, and the method for constructing the eight pieces. In fact, the instructions take up about forty verses. Why so much attention to the details of the high priest’s garments? Each of the fourteen layers in an Extravehicular Mobility Unit (EMU), otherwise known as a space-suits has a particular function: from a water cooling layer to regulate body temperature to one that regulates air pressure. We can also look at the gear that Olympians wear; fast swimsuits that give olympic swimmers an edge by reducing skin friction and drag of the body on the water. And what is it about being clad in tight fitting Lycra & Spandex that enables us to tackle exercise ? Returning to the high priest, what special function did his elaborate outfit enable him to carry out? Various commentators elaborate on the practical function of each garment, for example the bells sewn into the hem of his robe announced the kohen’s arrival. This is interesting, but not easily relatable to our own everyday life. The levushim don’t merely cover up the soul, so that it is embodied, but are what enable it to function in the world. This reframing of the physical as a vehicle for the spiritual expression is a recurring theme is hasidut and one that I find very useful. But to go back to clothes that hang in our closet, we all have some well worn favorites that we love. We may not be interested in keeping up with new fashion collections or even feel the need to change our wardrobe every season. We may be most comfortable when slip into our favorite cozy sweater. But is that a good thing? Think back to a time you wore something different for the very first time. How did you feel? I know that as a young teacher, barely a couple of years older than my own students, wearing a structured suit jacket was just what gave me the feeling of competence and authority I needed. Considering how our physical attire affects the way we feel, let’s imagine what we could achieve if we injected some creativity in our own soul’s garments. What could a Fashion Week for the Soul offer? A different way to access Torah; perhaps through the mystical language of the Zohar, or the lens of philosophy. A new ritual, perhaps one that doesn’t feel routine can refresh our spiritual practice. The new designs being paraded at Fashion Week can be easily dismissed as totally unrealistic for real people to wear, and thus irrelevant. In reality, there’s a huge amount of creative boundary pushing in fashion design, these ideas eventually filter down to the ‘ready to wear’ market and change what the average consumer buys and wears, and very gradually, even how we view what we have been wearing until that point. As we read Tezaveh over Fashion Week, let’s ‘live with the times’. Let’s step out of our old, comfortable, go-to wardrobe staples, and try out something we would normally dismiss. Let’s enable our soul to find new meaning in Torah and new expressions of holiness in our world. One of my childhood favorites, The Little Prince, is a little book by Antoine de Saint-Exupéry, a French writer, poet, aristocrat, journalist, and pioneering aviator who flew airmail routes, and joined the French Air Force at the outbreak of WWII. In this semi-autobiographical novella, the little prince is a boy from a tiny asteroid, who just appears out of nowhere to strike up a conversation with a pilot stranded in the desert, attempting to repair his airplane before he runs out of drinking water. 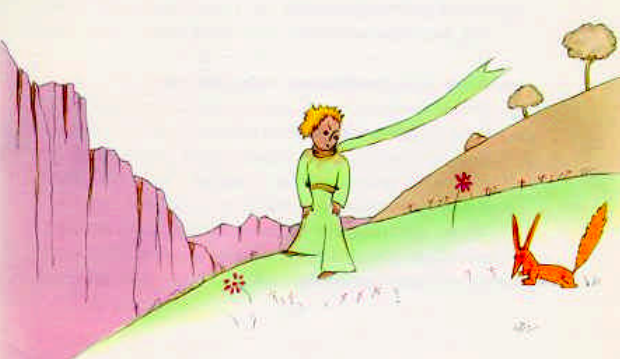 The little prince talks to him about various characters he has met on his travels. His sharp observations are full of wisdom. “It would have been better to come back at the same hour,” said the fox. “If, for example, you come at four o’clock in the afternoon, then at three o’clock I shall begin to be happy. I shall feel happier and happier as the hour advances. At four o’clock, I shall already be worrying and jumping about. I shall show you how happy I am! But if you come at just any time, I shall never know at what hour my heart is to be ready to greet you . . .
“What is a rite?” asked the little prince. “Those also are actions too often neglected,” said the fox. The fox is explaining the role and importance of ritual. Ritual requires the little prince to be consistent in the timing of his visits. Only through consistently visiting every day at the same time, the fox can begin to anticipate his visit and look forward. The fox is saying that the anticipation is not just a necessary step to get to the desired encounter, but is a pleasurable and essential element of the relationship itself. I will rain down bread for you from the sky, and the people shall go out and gather each day that day’s portion. But on the sixth day, when they apportion what they have brought in, it shall prove to be double the amount they gather each day. Rav Ḥisda said: A person should always rise early on Friday in order to prepare all of the expenditures for Shabbat, as it is written with regard to the collection of the manna: “And it shall be on the sixth day, and they will prepare that which they have brought” . On the surface, it seems that the double portion of manna on Friday is just a logistical detail. It is practically necessary to have a double portion on Friday, so as to have provisions ready for Shabbat, the day in which gathering manna is not permitted. But, if we look at the double portion gathered on Friday through the lens of the fox, we transform it into a ritual. The gathering of double manna, is not merely a technical detail that enables the Bnei Yiisrael to have food on Shabbat, it is crucial to creating the sense of anticipation that in turn creates the magic of Shabbat. One who painstakingly prepares before Shabbat, will eat on Shabbat. It is not simply about preparing the food and ensuring you can actually eat, but it suggests that the pleasure of Shabbat is inherent in its anticipation. Preparing for, and looking forward to Shabbat is what sets Shabbat apart from the rest of the week. It is what makes Shabbat feel special. The Talmud (Shabbat 119a) further describes the ways in which a number of Amoraim would ritualize their preparation for Shabbat. They each had their own set Friday errands and routines. Some of these are very practical, some less. Rabbi Yannai put on his garment on Shabbat eve and said: Enter, O bride. Enter, O bride. Rabbi Ḥanina would wrap himself in his garment and stand at nightfall on Shabbat eve, and say: ‘Come and we will go out to greet Shabbat the queen’. It is not simply to tell us that these Amoraim were helpful around the house on Fridays. The Amoraim understood preparing on Erev Shabbat as an important ritual in its own right. One should rise up early on Friday to prepare provisions for Shabbat. Even if one has many staff that can do it, they should make an effort to prepare something themselves in order to honor Shabbat. It’s not about getting the job done. It’s about entering into the task as ritual. Rabbi Joseph B. Soloveitchik used to say that the true mark of a pious Jew is not that he or she is a Shomer Shabbat, but is a Shomer Erev Shabbat, observing the eve of Shabbat. The narrative of the double portion of manna, with its earliest example of Shabbat preparation, invites us to consider how we might develop or enhance our own Shabbat preparation rituals. And how we might reframe ordinary chores into sacred rites that heighten our anticipation for the arrival of the Shabbat queen. Walking around a residential neighborhood on a winter’s night can be lonely experience. The streets are dark and desolate. Passers-by become anonymous and the sound of their footsteps intimidating. I usually walk at a fast pace, every fiber of my being intent on escaping the gloom. On a recent visit to Copenhagen, I found myself cutting through a residential neighborhood, on foot, at night, on my way to the buzzier Nyhavn district. As I was walking, I noticed my pace was unusually relaxed. I felt a sense of warmth and coziness, which the locals call hygge. From every house and building on the street, large windows cast a golden glow. I was out on a dark street, but my gaze was drawn into luminous homes, where I could see individuals at work, children at play and families gathering to eat. I found the windows of Copenhagen unusual, because as a Londoner, I am used to seeing homes with all curtains drawn, barely a blade of light escaping from the edge of a blind. Keeping their windows unscreened, the Danes projected a friendly warmth into the street, uncloaking the heavy darkness, and offsetting the loneliness of my journey. Hanukkah is a time for pulling back the curtains and setting lights at the window specifically dedicated to illuminating the outside. Now, in the final hours of Hanukkah, having watched all eight flames burn brightly at my window, I am considering how the Hanukkah lights can continue to transform the blackness outside, beyond the eight day. When stepping into the warmth and light of our own homes, we can quickly forget about the darkness and loneliness experienced by many. We draw the curtains and keep it out of sight, out of mind. But what if, at the end of Hanukkah we hold off on drawing back the curtains? Let our home shed light and warmth and transform the gloominess of our streets. Enjoying the coziness of our home, let’s keep a window clear and unshuttered, as a reminder to look out for those experiencing loneliness and isolation through transition, anxiety and uncertainty. The talmudic formulation of the mitzvah of Hanukkah as נר איש וביתו ‘a candle for each person and their home’ (Shabbat 21b) suggests the home as a particular anchor for our capacity to brighten the outside and light up the lives of others. 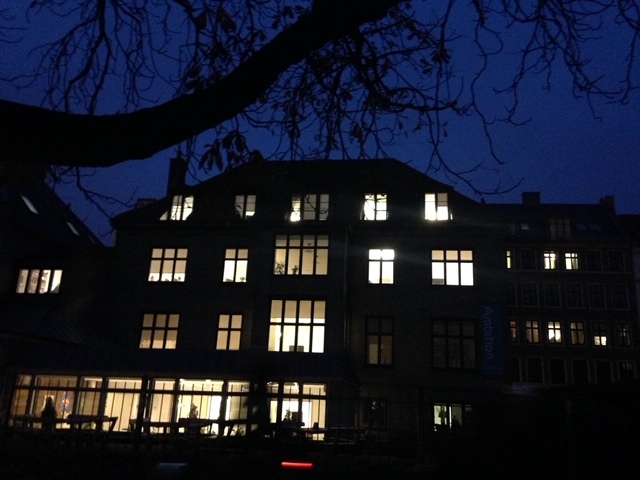 So, as Hanukkah draws to a close, let’s take inspiration from the windows of Copenhagen. Let’s radiate light through our homes, practicing our own form of hygge, spreading warmth, comfort, and encouragement. Will you take your rightful place? Will you step forward to dance with the Torah? Will you remain content watching from the side-lines? Will you self-consciously say ‘thank you I’m ok’ when invited you to join the dance circle or hold the Torah? The Torah reading for Simchat Torah begins with Vezot ha-Bracha followed by Bereshit. Rabbi Yehudah Aryeh Leib of Gur (1847–1905) notes that the letterbet of Bereshit symbolizes Bracha, blessing, and so the Torah begins with blessing and concludes with blessing in Vezoht ha- Bracha, pointing to its essence: blessing. God bestows the blessing as the ‘noten hatorah’ and the Jewish people in turn are a vessel to hold the blessing. This is what happens on Simchat Torah. On a personal level, by putting our arms around the Torah, we turn ourselves into a container that holds it, both physically and spiritually. On a communal level, as we join hands to form a dance circle, we unite create a larger container of love around the Torah. The Holy One, the Torah and the People of Israel are one. Simchat Torah is an urgent invitation to enact this unity. Who would ever be found righteous before You and acquitted by such judgement? While there’s a particular focus on the theme of Divine Judgement, God is not the only one we are scrutinised by. We are all subject to self-judgement. And while internal criticism can be healthy in moderation, in excess it can be detrimental to personal development. Untempered self-judgement, the little internal voice that says ‘you are not good enough’ can leave one feeling inadequate and incapable of achieving anything of value. As we read the Rosh Hashanah liturgy this year, it may be useful to bear in mind, that if we are asking God to temper judgement with compassion, we should apply the same balance to ourselves. By softening our harsh internal criticism and practicing self acceptance we can go on to make the positive changes we need to enjoy a blessed year ahead. The expressions Matan Torah and Kabbalat Torah suggest both a giving and a receiving of Torah. However, a riveting midrash (Tanhuma, Ekev 11) depicts a very different picture. It describes the tablets measuring six handbreadths in height and imagines God holding the upper third, Moshe holding the lower third with the middle third remaining in between the divine giver and the human recipient. Moshe then reached out and grasped the middle third, overpowering God as it were, drawing the tablets entirely into the human domain. Inspired by this midrash, Rabbi Yerucham Leibovitz (1873-1936) who served as spiritual head of the famous Mir Yeshivah in Poland, suggests that the assumption that God simply gifts Torah to us is mistaken. We are meant to be more than passive recipients. We are encouraged to actively reach, if not overreach, for the Torah so that we can possess it. I think this message is particularly relevant to women who too often assume a passive stance when it comes to Torah. They wait patiently to receive what others deem acceptable for them to receive, even when it is blatantly inadequate. The midrash indicates otherwise. When it comes to Torah there is no shame in demanding and grasping for more. On the contrary, it is through this hunger for greater access to Torah that Torah is truly honored. This iconic image of Belda Lindenbaum z’’l holding the Torah aloft for hagba’ah encapsulates this message. Belda boldly staked her claim and pushed all barriers to bring Torah into women’s domain. This Shavuot, let us all seize our share of Torah. I have to take a deep breath before I can answer this question. I was born in Milan and lived there until I left home aged 15 to continue my high school studies in Jerusalem. Upon graduating, I moved to the United States to continue my religious studies. Until that point I was from Italy. Over eight years in the ‘melting pot’ of New York I came of age with work, marriage and children. Just as I began to put down roots and see myself as Italian-American, our family relocated to London. All of a sudden, it became a little complicated. Yes I have been living in New York. But if I was back in New York, I’d have to explain I was Italian but living in London. Then came a point when I would visit Italy and my italian sounded a little foreign. You speak italian really well. Where are you from? I had envisaged our move to London to be temporary. But ten years on, I had been living in London longer than I had ever lived in New York. I did not feel British. My husband and children all acquired British citizenship, I remained Italian, but finally acquired a pair of wellies. Sixteen years on, I realized I had been living in London as long as I had ever lived in my native country and twice as long as I had lived in the United States where i had developed my adult identity. Just as I marked two decades of life in London, producer Rachel Wang got in touch requesting to interview me for a film feature called 1000 Londoners. Rachel’s questions about the buildings, views and features of London that I most liked (and disliked!) made me realize, that while I don’t identify as British, I do identify as a Londoner. I am comfortably at home in Milan, Jerusalem and New York, but London is my city. I love its energy and architecture, its eclectic fashion, art and design scene. I am grateful to Rachel for finding the Londoner in me by including in me as Londoner #212, which is the area code for New York! This year, the lunar and solar calendar are so aligned that my birthday falls on two consecutive days, the 9th May is followed by the 14th Iyar, turning it into a two-day ‘yom tov’. To mark the occasion I am sharing two different insights on the contemporary relevance of Pesach Sheni. Pesach Sheni: A Sense of Belonging looks at the significance of a second opportunity to celebrate Pesach, while Exemption & Exclusion: Reflecting on Pesach Sheni considers the cost of exemption from ritual, particularly in the context of women’s participation. The Hanukkah lights are traditionally positioned at the window, so that they illuminate the darkness outside of our homes. This mitzvah speaks of our obligation to brighten the lives of those outside the nucleus of our family and our own community. The Talmud in tractate Shabbat explains that the mitzvah of Hanukkah can be fulfilled by one person lighting a candle on behalf of their household, but suggests that the optimal ‘mehadrin’ fulfilment is for each individual to kindle their own light. This obligation includes women, as Rabbi Yehoshua ben Levi states: ‘women are equally obligated, as they too were part of the miracle’. The formulation in the law of Hanukkah suggests that while we can get away with just one light per household, each individual is nonetheless encouraged to set aside some oil – a metaphor for the energy and passion that fuels our activity – required to kindle their personal Hanukkah light and illuminate the outside world. This a lofty ideal, but in practice most of us, in particular women, experience an ongoing tension in trying to balance the energy we devote to the personal versus the public spheres. TheTalmudic sage Rava addresses this tension saying: ‘’If one must choose between a house-light (for Shabbat) or a Hanukkah light, the house-light takes priority’. While Rava speaks of a case where one’s monetary budget doesn’t stretch to buying oil for both Shabbat and Hanukkah lights, we can apply his principle to situations where our time, energy and emotional resources are limited. In such cases our priority should be on the inner circle of our family. But having clear priorities to our family may not be enough. While work is permitted on Hanukkah, women have the custom to abstain from domestic chores while the lights burn. According to the mystics, abstaining from work enables us to absorb the holiness of the moment. This custom speaks of the importance of investing in spiritual self-care. Taking time to internalise the holiness of the Hanukkah lights is crucial if we are to illuminate external darkness.